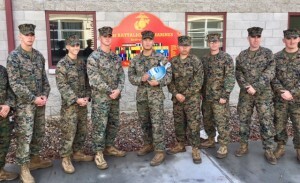 We dropped off 200 turkeys at Camp Pendleton for the Marines to enjoy a Thanksgiving dinner. Not all of our Marines will get to see their families during the holidays, but hopefully they all know that we are here for them. We are grateful for our Marines and our supporters. Thank you. 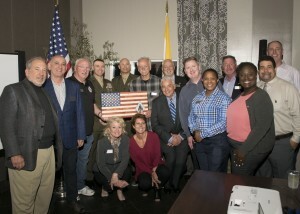 The Newport Beach 1/1 Marines Foundation and the 1/1 Marines Battalion are very grateful for all the support we receive over the years from our strategic partners. We appreciate all the efforts to honor our troops and thank you for making what we do possible. 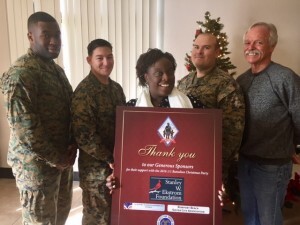 The Newport Beach 1st Battalion 1st Marines Foundation was able to contribute to a very successful Marines Children’s Christmas Party at The Ranch House on Camp Pendleton with the very generous support of the Newport Harbor Republican Women’s Group and our other strategic partners. We would like to thank the Toshiba Classic for hosting Military Appreciation Day during the tournament as well as their generous donation to the 1/1 Marines Foundation. 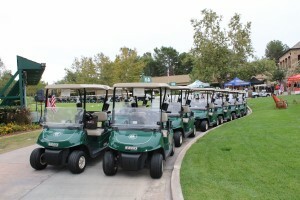 Thank you to the Newport Beach Police Association Charitable Foundation as well as all who participated and supported the 2016 Charity Golf Classic at Big Canyon Country Club. 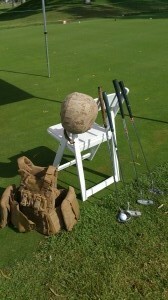 We enjoyed a great day of golf in support of our troops and could not have done it without you. Marina Park Opening with Mayor Selich and a special thanks to Color Guard, Sergeant Arustor Campbell, Corporal Kristopher Ezel, PFC Kevin Riebling, and PFC Jeremy Gozales. 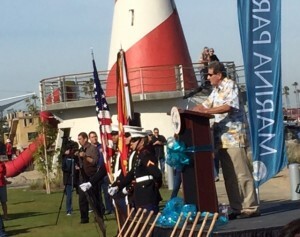 The Exchange Club of Newport Harbor hosts the Annual Field of Honor at Castaways Park. 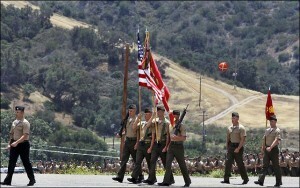 Each year 1776 3’x5′ US Flags will fly in honor of all military men and women. Join us for the 7th Annual Field of Honor May 20 - 22, 2016 and dedicate a flag in honor of those who protect us. 100% of net proceeds are donated to families of our service men and women, other Americanism projects and youth charities in our community. 1/1 Marines Foundation is a proud partner of the Newport Beach Junior Lifeguard program. The Monster Mile has a theme for each year, in 2014 the theme was American Heroes honoring those who serve. They requested our presence and we were able provide 8 Marines. The program is set up by the Marine Safety Division of the Newport Beach Fire Department. The 1/1 Marines were the Grand Marshals of the Newport Beach Junior Lifeguard 2014 Monster Mile. 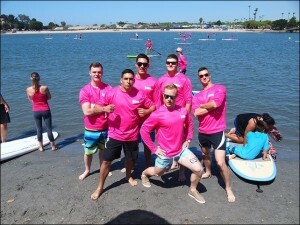 The 1st Battalion, 1st Marines partnered with the Emery Team Home Point Financial to Standup for the Cure to support the local affiliates of Susan G. Komen. Each affiliate uses 75% of the net proceeds to fund local life-saving education, screening, diagnostics, treatment and survivorship programs. The remaining 25% is invested in global breast cancer research. Enjoy these photos from previous 1/1 Events as well as some photos from the 1/1. See photos and latest news from the 1/1 on our Facebook page – click here.